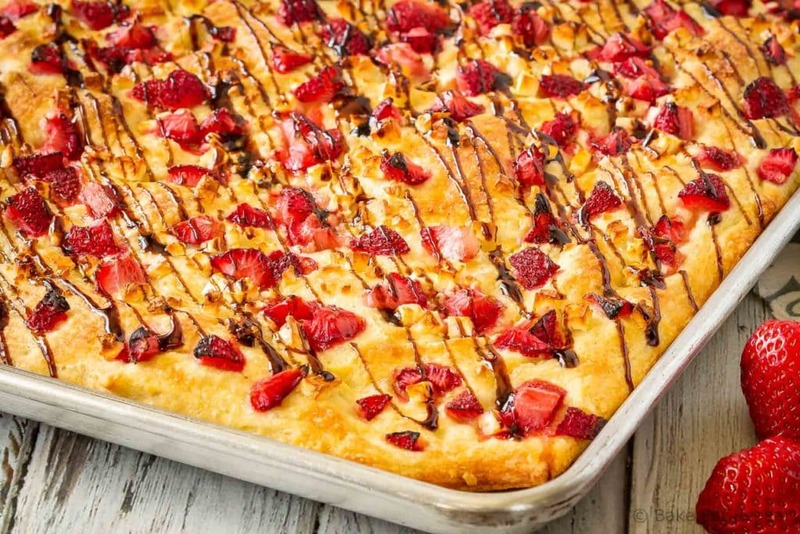 You would think that this easy focaccia with strawberries, feta and balsamic glaze would be the sort of thing that only the adults at the table would be interested in, right? If so, you would be wrong. At least at my house. But maybe my kids are crazy and have weird taste in food. I’m not denying that that’s a possibility. They did all decide black olives were their favourite food at a very young age (I think 2, maybe 3?). They still love them – while most kids won’t touch olives, I’m sure. So….maybe it’s just my kids? They went crazy for this easy focaccia bread. They even insisted on the balsamic glaze, although I gave them the option of focaccia bread without it. Nope, evidently they all love balsamic glaze, too. I’m okay with this. 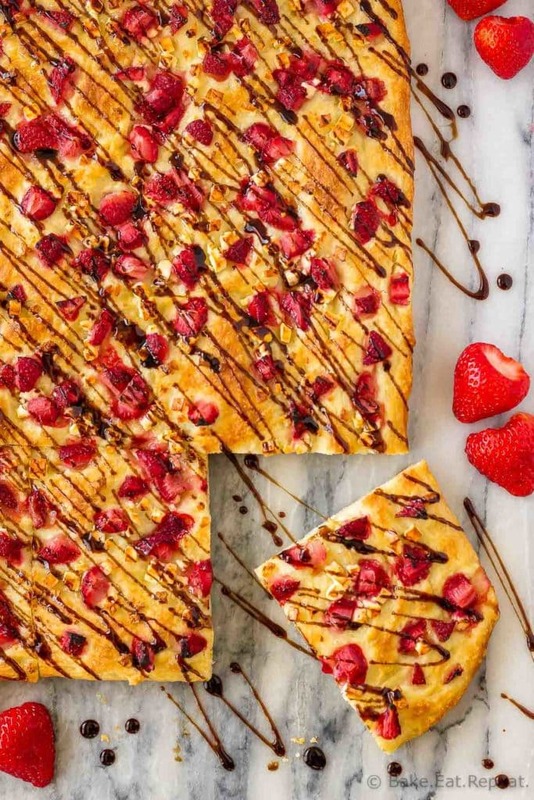 It means I can make this easy focaccia with strawberries and feta over and over, and no one will get sick of it. It’s even great the next day as leftovers – not even necessary to reheat it. We enjoyed it warm from the oven with dinner one night, and the next day had it cold for lunch. We loved it both ways. Also – easy lunch making when you can just give the kids a piece of focaccia from the night before and they’re thrilled about it! What makes focaccia bread different? Focaccia bread is a type of Italian yeast bread that is baked in flat sheet pans. The dough is flavoured with olive oil and sometimes has herbs and vegetables on top. I figured if it can have vegetables on top, why not fruit? 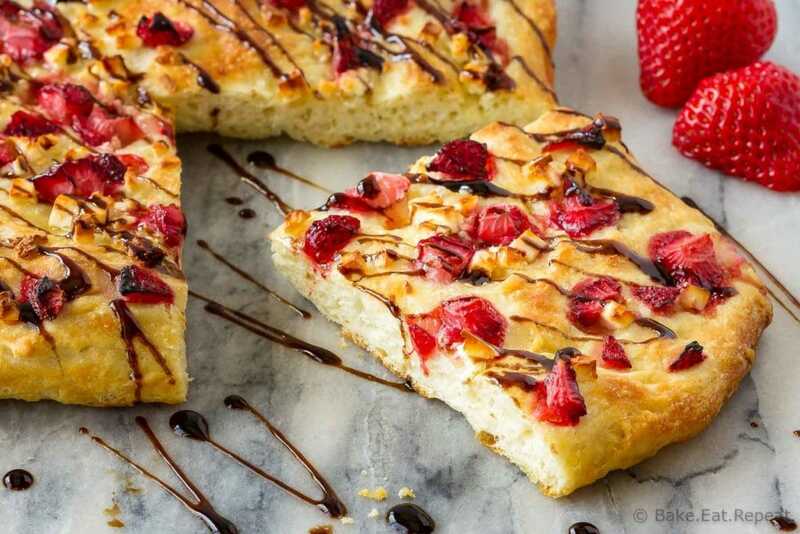 Sweet and salty combinations are amazing, so adding strawberries and balsamic glaze to the traditional olive oil and coarse salt topping of focaccia bread seemed like a great idea. What is the difference between focaccia and pizza dough? The difference is the amount of leavening used. Pizza dough uses less leavening so it doesn’t rise as high as focaccia bread does. How do you store focaccia? Generally you can store focaccia in a plastic bag at room temperature. Because of the feta cheese on this version, I like to keep it in the refrigerator instead. You can reheat focaccia in a 350 degree F oven for about 10 minutes. This bread dough doesn’t require any kneading at all, just mix it together with a dough whisk or a wooden spoon until the flour is all hydrated – this takes a couple full minutes of stirring to get it all combined. Make sure not to over-bake this focaccia bread or it will be quite crispy – it should be a chewy bread with a crisp crust. The feta does get a bit browned and the edges get a bit crisp in the oven – if you prefer it to stay soft you can sprinkle it on after the focaccia is baked instead. Here are a few more great bread recipes for you: Soft Flatbread, Icelandic Brown Bread, and Homemade Cream Biscuits. 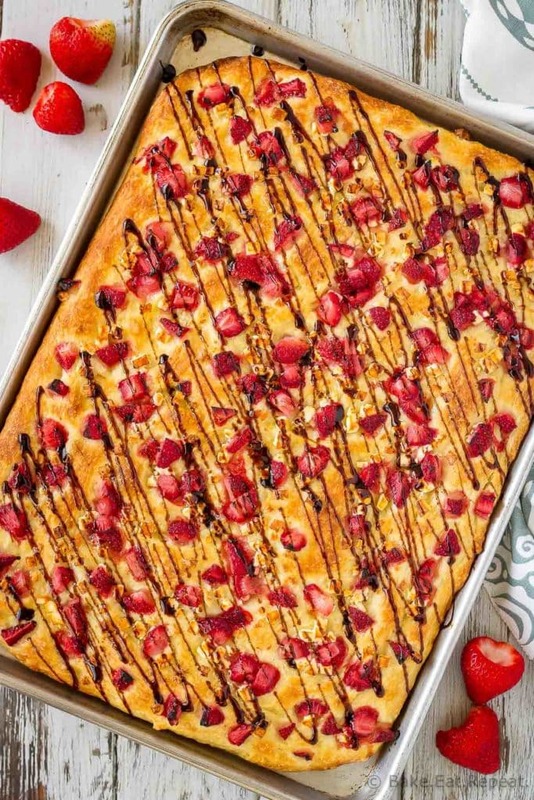 I’ve also shared this Easy Focaccia with Strawberries and Feta recipe over on Food Fanatic.